Philip is one of Australia’s most experienced camelmen. He has a lifetime of experience with hundreds of trained camels to his credit and over 30,000 kilometres of desert trekking experience. Using trust-training techniques Philip puts his immense experience to work with spectacular results. These workshops are designed to give you an invaluable insight into the intricacies of camel training and camel management with either handled or unhandled camels. All too often, prospective camel buyers are confronted with purchase options with a questionable pedigree and history, and almost invariably the result is a compromise from what was initially desired and a subsequent lack of confidence in the process and the emerging camel industry. Our Camel Training and Handling Workshops take away much of this uncertainty by giving you the necessary skills to chooose your future camel(s) wisely. You will also learn skills that will help you understand your camel, a fundarmental requirement for skillful handling and training. Camels that have been chased for miles by motorbikes, or jumped onto out of a helicopter, or roped and thrown from a four-wheel drive vehicle before it gets to you are problematic for obvious reason – they already fear people! Nor do you want inbred or reject rogues that no one else wants. Ideally, you need to be able to purchase and start with an unruffled, curious, healthy and untouched camel, aged between 2-5 years, which has not lost its fragile and natural desire to trust. The results from a start such as this are overwhelmingly superior. Our workshops focus on trust training where a trusting and cooperative relationship is built between animal and handler. This process is simple and once completed you will understand the key principles that govern a camel’s behaviour and adapt your own actions to take this powerful new knowledge into account. These workshops are a must for pending camel owners and invaluable for existing owners seeking to understand their camel and camel training for the first time. 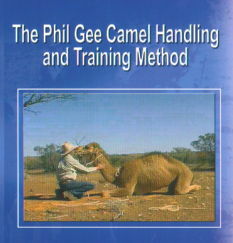 The Phil Gee Camel Handling and Training Method (63 mins, pal/ntsc). Using trust-training techniques Philip puts his immense experience to work with spectacular results in this DVD. Beginning with a young and untouched wild desert camel, Philip demonstrates how to win a camel’s trust and then its co-operation. You’ll never think of camels in the same way again. This training DVD contains potent demonstrations of instructed principles, a mixture of ideas that are as simple as they are effective and a welcome down-to-earth outback Australian style. This DVD is much needed by camel owners and enthusiasts in the west and is essential viewing for those wanting to begin with camels. Produced by Kamahlfilm 2003. US$55.00 (postage included). Australian buyers have reduced postal rates.